May they feel the Lord’s healing touch. Nanette Bachmann, Thelma Battle, Graeme Becker, Sofia Birch, Carolyn Becker, Lucas Bonnici, Anne Brandsen, Vincent Brandsen, Rosario Burgos, Ann Campsie, Debbie Chambers, Jennifer Corazzol, Janice Eather, Pat Finch, Anita Gabriel, Jeffrey Graver, Patricia Gurney, Mary Hall, Ben Hall, George Hartman, Gordon Hedger, Nor-man Hedger, Val Hintz, Dolly Holmes, Jeffrey Imperial, Peter Kastadoros, Laurie Keating, Wally Knight, Mary Kolosowski, Joanna Lebsanft, Thomas Desmond Lewis, Ruth Marshall, Jill Palmer, Marissa Pangan, Dorothy Perry, Robyn Porter, John Pow-ell, Chase Rafael Payne, Mary Rogers, Jonathan Ronquillo, Alice Rubio, Gavin Stew-art, Jodie Taylor, Laurie Topp, Kev Topp, Peter Topp, Kallum Topp, Dulcie Urch, Ruth Williams, Vicente Velasco Jr, Olive Vincent, Marcella Van de Vorstenbosch, Elizabeth Yip, Googol Zillionoro. Prayers are also requested for the following nursing home residents at Beenleigh, Pimpama, Bethania Gardens, Jimbelunga—Eagleby, Connolly Court, Palm Lake, Jeta Gardens and Woodbeck Village. United Youth: For the next few months, our meetings will be on the 2nd and 4th Fridays. The next 2 dates are 12th and 26th April. Any young people from the age of 10 are welcome to join us at the St Joseph’s School hall. Youth Masses: 6pm Sunday 7th April, with practice at 4pm and Prayer and Praise at 5.30pm; 9am Easter Sunday 21st April, with practice at 8am. Youth Leaders’ meeting: 7pm on the 1st Tuesday of every month. Band practice: Tuesdays (apart from 1st Tuesday), 7pm - 8.30 in the parish office. Stations of the Cross: There will be Stations of the Cross every Friday dur-ing Lent at 7pm in the Church. 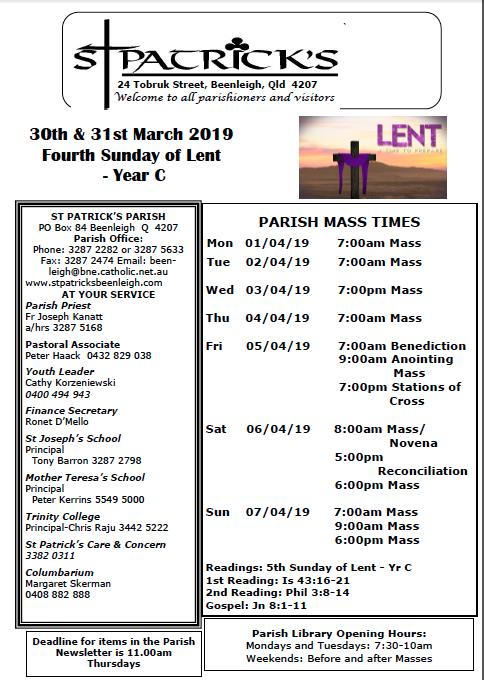 Reconciliation: Second Rite of Reconciliation will be available Tuesday 9 April 6:30pm.We are encouraged to take advantage of this great opportunity to re-ceive the Sacrament of Reconciliation as we prepare for Easter. Trash & Treasure Stall: 6/7 April, before and after Sat 6pm, Sun 7 & 9am Masses. Please donate jams, cakes, plants or whatever you think will sell. You can leave all saleable items in the Truelson room. Thank Betty. 0439 791 133 or 3807 9986. PARISH CHOIR continues in Church on Monday’s, 7pm to 8.30pm to prepare for the Feast of St Patrick and the Tridium. Parishioners are invited to join the choir and en-rich our celebrations with their singing. 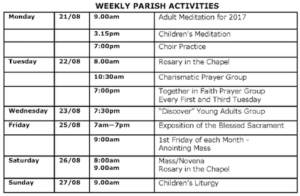 Contact Parish office for more information. Sacramental Program 2019: First Holy Communion information session for children that have received to sacrament of Confirmation will be Tuesday 30 April 6:30pm and Thursday 2nd May 6:30pm. Everyone has questions. We all explore, every day. For all our searching – it’s rare to find time to think, and talk, about the big questions of life; about faith and reason and God We believe everyone should have the opportunity to explore life and the Christian faith. To ask questions, and share their point of view. YOU ARE ALL INVITED. ANYONE INTERESTED IN BECOMING AN ALPHA GROUP LEADER. PLEASE COME ALONG,ENJOY A MEAL,A VIDEO AND A TALK WITH FRIENDS. Readers & Extraordinary Ministers of Communion: If you would like to continue to exercise your ministry, please PRINT your name and indicate which Mass you attend on the sign on sheets in the Truelson room. 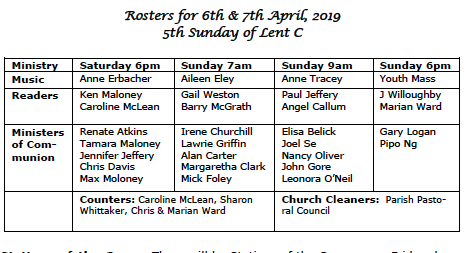 We urgently need more Communion ministers and readers for Sunday 6pm Mass. If you would like to volunteer please con-tact the parish office for more information. Are you between 18-35 years old and want to make a difference? Join us for the Canossian Australian Volunteer Immersion to Papua New Guinea from 23rd June – 3rd July 2019. This will be a formation based opportunity to help out in our Ca-nossian mission in Port Moresby and to immerse yourself in another experience of life. Places are limited so get in quick. For more information contact Sr Mel on 0484 007 508. Bequests to the Parish: Should any parishioner be considering making a financial bequest to St. Patrick’s Parish , such a bequest must be included as part of your Last Will and Testament. There is an exactly worded statement required to be used in making such a bequest. This exact statement can be obtained from the Parish Office. Project Compassion GIVE LENT 100% Project Compassion is Caritas Australia's annual Lenten fundraising and awareness-raising appeal. Millions of Australians come together in solidarity with the world's poor to help end poverty, promote justice and uphold dignity. Donate today. Envelopes are available in Truelson room.